Red Hill Iron Limited (RHI or the Company) was formed in 2005 with the purpose of acquiring and evaluating the iron ore potential of its extensive tenement package covering much of the western margin of the Hamersley Province of the West Pilbara region of Western Australia. The Company has 49,405,037 fully paid ordinary shares on issue and 500,000 unlisted options. The Company's primary assets are its Red Hill Iron Ore Joint Venture (RHIOJV) interest and its wholly owned Pannawonica channel iron project. It also has quarrying opportunities in the same region. RHI holds a 40% carried interest in the RHIOJV, with API Management Pty Ltd (API), a company controlled by Baosteel Group Corporation and American Metals & Coal International, holding the balance and earning up to 80% by carrying the Company through to the first sale of ore from the tenements. The RHIOJV accounts for the substantial portion of API's West Pilbara Iron Ore Project (WPIOP), which has proven and probable reserves of 445 million tonnes. 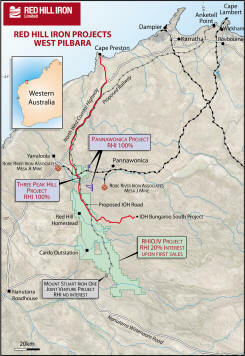 The WPIOP was formed to explore for and develop iron ore resources in the West Pilbara and has the stated aim of establishing a rail link to a proposed new port at Anketell Point to facilitate ore exports. The Company has an election right, up to the time of first commercial sales of ore, either to continue as a joint venture participant in the RHIOJV with a 19% contributing interest (which will involve an obligation to repay half of API's carry costs out of 80% of the Company's share of project free cash flow) or to convert its joint venture interest to a 2% FOB royalty on all RHIOJV production. RHI has recently completed an Ore Reserve estimate and Prefeasibility Study for its wholly owned Pannawonica Project, which contemplates a CID direct shipping operation from the Company's three Mining Leases. The Company has also secured a Mining Lease over porphyry rock outcrops suitable for quarrying products for proposed nearby mine, road, port and rail infrastructure developments. This website includes initiating broker coverage of the Company's activities. The report can be found in the Reports section of the website.